Protect your drip irrigation system by using DIG’s Air Vacuum Relief Valve with 1/2" MPT to prevent back suctioning of debris into the drip line. The Air Vacuum Relief Valve allows air to escape the drip line when the system starts up until the pipe or drip line is full of water. It then allows air to enter back into the drip line when the drip system shuts off. 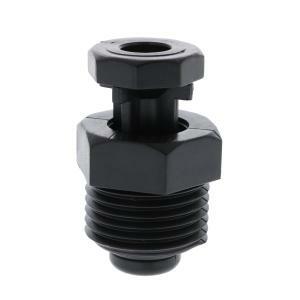 This increases the efficiency and performance of your drip system. Install one Air Vacuum Relief Valve per zone or per each 10 GPM flow. Installing Air Vacuum Relief Valves after the drip zone, along the drip line laterals and at the highest point in the drip system is recommended.